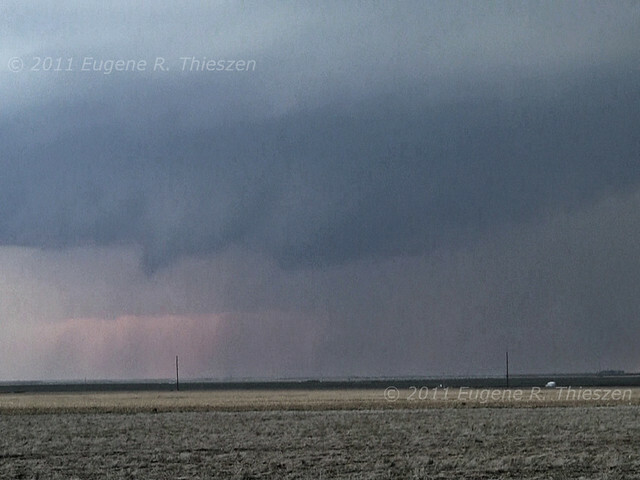 Set out from Cordell about 1 pm for my initial target near Liberal, KS. 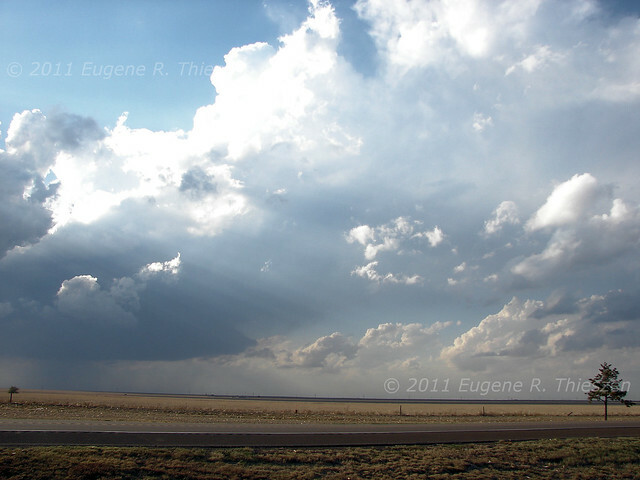 As I neared Liberal shortly before 5pm CDT an agitated cu field was evident SW of Turpin, OK. I filled up with fuel in Liberal and headed N on US 83 a few miles and pulled off on a county road intersection to observe. Before long a storm began to form, although it took awhile. I eventually set up at the US 83/160 junction. I followed this storm and one developing behind it as they moved quickly N at 40-45 mph to well N of Sublette and then elected to turn around and intercept a third severe-warned storm that had developed near Hugoton and was now approaching Ulysses. 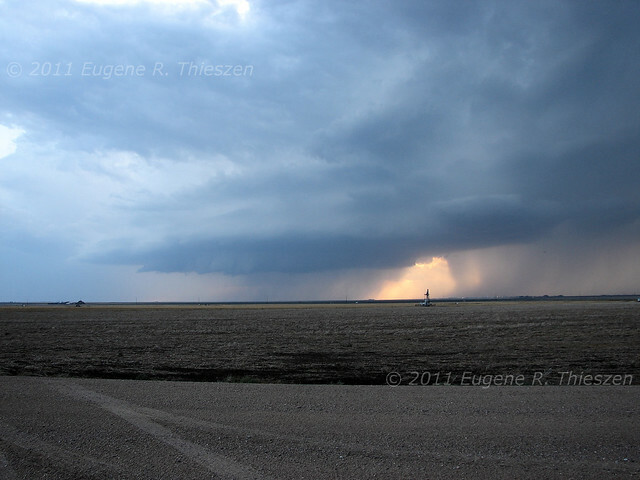 This storm was moving much more slowly and as I approached I could see it had decent structure. 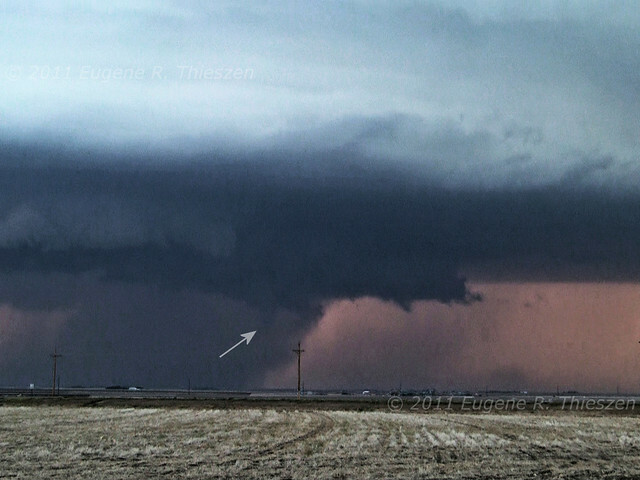 The storm had a lowered area with broad rotation and before long a funnel cloud was evident. The funnel dissipated quickly and the storm continued to move NE at about 25 mph and developed an incredibly long beaver tail. The lowered area remained active, although the low-level rotation was apparently never strong enough for the storm to be tornado warned. Another somewhat longer-lived funnel developed and for a bit I actually thought we might have a tornado, but it was not to be. I continued N of CR CC to the junction of CR 5 following the storm as darkness fell. The storm was quite electrified and as a result the active area was easily visible as I observed it for 20 minutes or so. The storm had impressive structure which would have been interesting to see in the daylight. Another severe-warned storm was coming up toward my position from the SW near Ulysses, so I headed W on CR 5 to take a look. 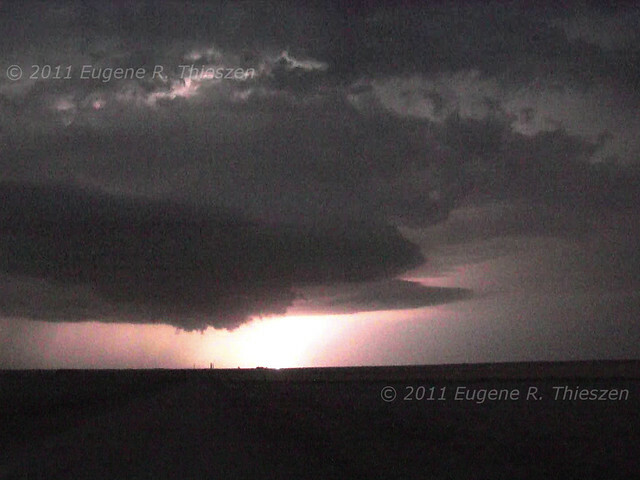 I observed some brief lowered areas in the lightning, but shortly abandoned the chase to return home.